Jean Warin teaching the young Louis XIV history by medals. Conti Museum, Monnaie de Paris. Photo: the author, 2018. I recently revisited a painting, Jean Warin instructing the Young Louis XIV in the appreciation of medals (ca.1645), at the Monnaie de Paris. I have been thinking about that picture for many years now. Looking closely at the strange double portrait, and the coins and medals in its boarder, has prompted me to extend the analysis I published in my book Antiquarianism and the Visual Histories of Louis XIV (2015). I include here new specifications about the sources for ancient coins and modern medals in the border with additional illustrations. François Lemaire (attributed), Jean Warin instructing the Young Louis XIV in the appreciation of medals (ca.1645) (with later additions), oil on canvas. Image courtesy of the Musée de la Monnaie, Paris. 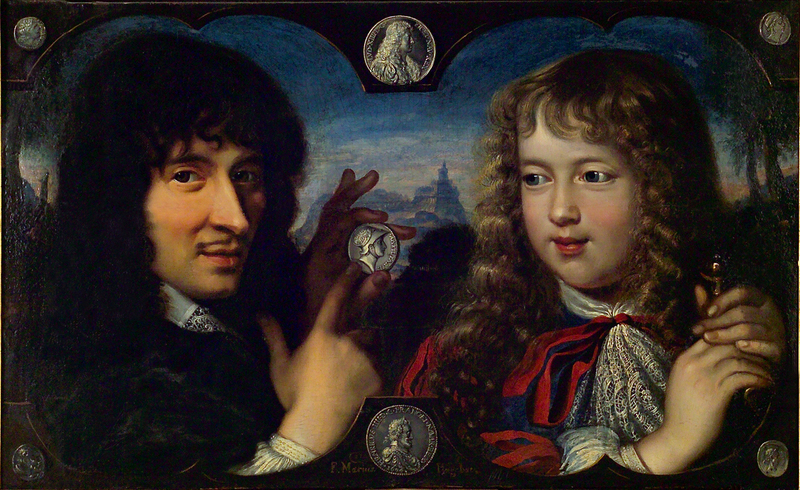 Jean Warin instructing the Young Louis XIV in the appreciation of medals, ca.1645, attributed to a lesser-known artist François Lemaire, shows the celebrated medal-maker Warin and Louis as a child. [i] Warin was a fine engraver and celebrated sculptor and his expertise in engraving dies for struck medals established his monopoly as royal medalist, working for both Louis XIII and his son. [ii] Evidently he had refined his own numismatic practice through a study of ancient coins, and many of his designs emulated classical precedents. This equipped him with knowledge of numismatics that he could pass on to his royal patron, a mutually beneficial exercise that would enable him to form a close relationship with the monarch, and ensure the continued support of his profession. A border of assorted coins and medals frames the two figures in Lemaire’s painting—a curious later addition of the 1660s—evokes the role that this lesson in history played in the formation of the future king. [iii] Louis at seven is depicted to the right of the main panel, but above him, top center, he appears as a young man. Jean Warin, NULLA DIES SUB ME NATOQUE HAEC FOEDERA RUMPET [“never in my name will this treaty be broken”] (1663). Silver medal. © Département des Monnaies, médailles et antiques. BnF. (Top left) Alexander the Great: deified on an 3rd century Imperial Roman coin (coin of the Macedonian Koinon). It is likely that the artist or patron thought this to be an ancient Greek coin of Alexander. Hercules: Giovanni da Cavinno after Alessandro Bassiano (? ), Hercules, modern medal, Padua, c. 1520-70. Warin’s medal takes pride of place among these great men at the central apex of the panel. The addition of these coins and medals brings reflected glory to Warin, who likely commissioned this painting, with his portrait of his famous patron occupying a central position within medallic history. By placing the king among such illustrious predecessors from the ancient and recent past, Louis XIV is presented as the inheritor of their glory and their historical agency. Just as Caesar determined the narrative of ancient Rome, Louis XIV would forge the path of history in his own time. Warin holds a medal in one hand that he points to with the other, and the gesture invites comparison between the subject of this portrait and the young king. It is a modern medal by Valerio Belli from the early 16th century that depicts the ancient Greek general Alcibiades. However, it is possible that seventeenth-century painter or painter responsible for its inclusionthought it to be Alexander the Great. [vi] The life of Alexander would have provided many scenarios for the young prince to ponder and hone his own skills at decision making, and leadership, which Jacques-Bénigne Bossuet (1627–1704) would later argue was the purpose for the study of history by princes. [vii] Indeed, the ancient Macedonian general would become the young king’s alter ego, with Charles Le Brun’s famous Alexander paintings of the 1660s long thought to allude to the French king. [viii] With the later addition of Warin’s 1663 medal of Louis XIV, the medalist’s upward-pointing gesture emphasizes the symbolic function of this coin drawing a connection between it and that of his patron—the new Alexander. The temporal distance between child and adult, ancestor and ancient precedent are collapsed within the unifying field of the painting. An Arcadian landscape provides the perfect ahistorical backdrop. The young king and his instructor have left the present through their study of medals, the usual constraints of time no longer apply to them, and they are able to move freely from past to present to future by way of the medals before them. Here the medal is presented as a conduit in history—a token that could transport its bearer to another time. Médaillier, with drawers from Louis XIV’s Cabinet des Médailles at Versailles. Louvre. OA11852. Coins and medals from the ancient and modern world could be selected at will to invite comparison between figures of the present and the past; those that they would hope to emulate, and those whose crimes and errors must be avoided. Seventeenth-century French antiquarian Charles Patin described medals as a means “by which we are made aware of the rules that form our moral philosophy,” through the example of those who came before. [x] A collection of medals was a visual and tactile library of history where the numismatist could select a piece, examine it, and have seemingly unmediated access to the time from which it came. Such was the utility of numismatic collections in seventeenth-century France. They were a resource through which the grand narrative of history could be assembled and discoursed upon, for study and leisure. [i] On Jean Warin and this painting see Jean-Luc Desnier and Evelyne Robert, “L’art de la médaille selon Jean Varin,” Gazette des Beaux-Arts CXX (1992): 1–14. [ii] On Jean Warin more generally see François Mazarolle, Jean Varin: conducteur de la monnaie du moulin, tailleur générale des monnaies, controleur générale des poinçons et effigies: sa vie, sa famille, son oeuvre, 2 vols. (Paris: Bourgey & Schemit, 1932); Nicole Darding, “Jean Varin: de Liège à Paris,” Art & Fact 15 (1996); Mark Jones, “Jean Warin,” The Medal 11 (1987); Jones, A catalogue of the French medals in the British Museum, vol. 2, 1600-1672, 177–87. [iv] Desnier and Robert identify this as a medal of Warin’s design, but misdate it to 1662. Ibid, 3. [v] The coin lower left has an ancient Greek appearance, lower center, is a medal of Henry IV, Louis’ grandfather by Guillaume Dupré from 1604, lower right is an ancient coin of Julius Caesar ca. 40 BCE, upper right a contemporary coin of Constantine, upper left an Alexander inspired by Hellenistic examples. Idem. [vii] Jacques Bénigne Bossuet, Discours sur l’histoire…. (Paris: S. Mabre-Cramoisy, 1681), 1 ff. [viii] See Donald Posner, “Charles Lebrun’s Triumphs of Alexander,” Art Bulletin 41, no. 3 (1959): 237–48. [ix] The inventories of Louis XIV’s cabinet at Versailles show that the medals were arranged according to size, metal and era, see below for further detail. [x] Patin, Histoire des médailles, 11–12.